I love a good mystery, don’t you? Well, the Doucet family has one and it’s a doosey. Marie Rundquist, the founder and administrator of the Amerindian Ancestry Out of Acadia project at Family Tree DNA has recently written a new paper about the C3b results within the project. Marie’s paper, titled “C3b Y Chromosome DNA Test Results Point to Native American Deep Ancestry, Relatedness, Among United States and Canadian Study Participants,” tells about the project and the findings relative to haplogroup C3b. Her raw data is available within the project. The Native American people involved are the Mi’kmaq and ironically, while we have found several Mi’kmaq men who carry haplogroup C3b, we haven’t found any carrying the much more common Native American haplogroup Q1a3a. The Acadian people were French and settled in the eastern-most region of Canada beginning in 1605 in Port Royal, Nova Scotia. They mixed freely with the Native people and intermarried. Beginning in 1710 and continuing until 1755, when they were forcibly deported, they were in conflict with the English government and refused to sign an oath of loyalty to England. The families were highly endogamous. Today, if you discover you descend from an Acadian family, you will discover that you descend from many Acadian families. I have one cousin who figures out that he and I are related 132 different ways. 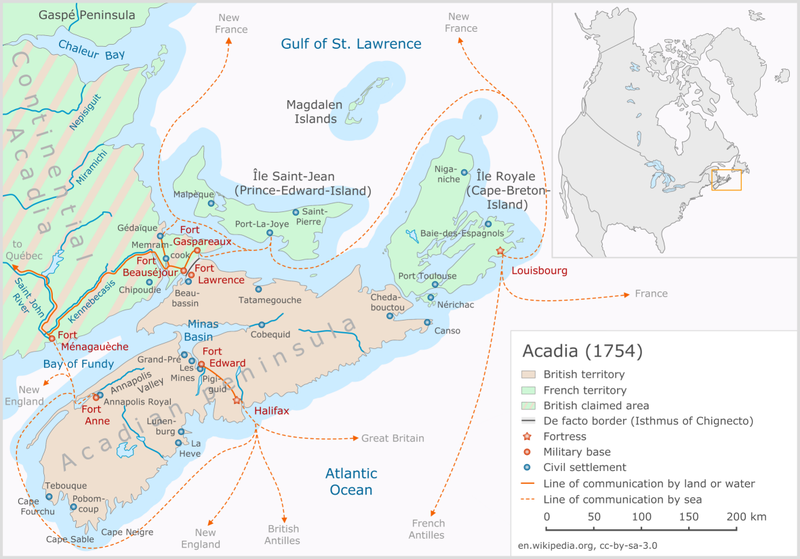 The map below shows Acadia just before the Acadians were deported. Marie’s paper shows that 6 different families with different surnames carry haplogroup C3b and all are related within 16 generations, or between 400 and 500 years. Many are, of course, related much more closely. The Doucet family is represented by 8 different males who all tested as haplogroup C3b. They descend from various sons of Germain Doucet, born in 1641. Germain was always presumed to be the son of the French founder, Germain Doucet, born in 1695 in France, the commander of the garrison, Fort Royal. Hmmm, this is known as a fly in the ointment. Indeed, the original descendants of Germain Doucet (1595) who had tested carried haplogroups of R1b1a2, clearly European, just as we would expect. But then, there was another Doucet test and he was discovered to be haplogroup C3b. This of course, raises questions, none of which can be readily answered. Doesn’t every genealogy find raise at least two new questions? Well, this one raises a few more than two. The other son of Germain Doucet (1595), Pierre tests to be R1b1a2, while “son” Germain (1641) tested to be C3b. Obviously, these man cannot both be the genetic children of Germain Doucet (1595) and unless a Native American Mi’kmaq male made their way to France sometime in the distant past, Germain (1641)’s father was not from France and was not Germain Doucet (1595). We know that Germain Doucet (1595) arrived in Port Royal in 1632, was noted as the commander in 1640 and returned to France in 1654 after Port Royal fell to the English, leaving at least two of his 4 children who had married in Port Royal. So what happened? Here are some possibilities. One of Germain Doucet’s older daughter’s had an illegitimate child and named him Germain Doucet, in honor of her father. Germain’s wife became pregnant by a Native man. A Native person adopted Germain Doucet’s name out of respect. When Native people were baptized in the Catholic faith, they were given non-Native names. So, through Marie’s project and hard work, we’ve solved one mystery and introduced yet another. This entry was posted in Acadian, Micmac. Bookmark the permalink. I would guess that one of Germain Doucet’s (b. 1595) daughter’s had an illegimate son and this child being brought up by the grandparents would be a more likely choice. It is possible that his wife may have been pregnanted by a native depending on how old she was when Germain b. 1641 was borned. If the Germain Sr. was 49 and his wife around the same age in 1641 chances are she was to old to be having another child at 49 though not impossible. it is entirely possible that Germain the younger, was ” adopted” from the Mikmaq , possibly after the death of his mother ( and possibly father) by Germain the older and his wife. The child could have been named by his original parents in honor of Germain the elder and were friends with the Doucets. and when the child was orphaned he was adopted by Germain the elder to honor their friendship . The child would have been brought up as one of the French family. according to what I’ve been reading, C3B seems to accure way West of Nova Scotia or Quebec, is there more data as to the nation this might belong to? Not yet. We hope one day to know more. I have for the past (20) years and plus reading how the gov. and all these gov.people,are still doing their best to eliminate and geno-cide the acadian mic-mac,especially those who speak french.yes,the war is not over.the lies they speak have reached heaven.We have a God,who is the author of TRUTH, and of course ,they can cover up the truth,but they canT HIDE IT. We are still out here ,and we have all the documentation we need to prove who the acadian indians are.The Doucet linage has always been a major target for destruction,(those non-status doucets) by the minister of indian-affair,and their faithful followers,Ive been lie to by the church of rome,provincial and federal employees,university of moncton,catholic archives,and also some who dare call themselves mic-macs.Shame on you! See if these folks can help you they are volunteers and helped me find my 2nd great grandmother Marie Berube who had no birth or death certificate…thanks to Charlie Dan Roach I found her and a whole line of family throughout the Quebec area…she married a Doucet from Nova Scotia. Never mind I see the answer .. Would have to get ahold of male doucet cousins .. If we females are tested .. What does it tell us about OUR family line .. Does it tell the story of the females only. .. Or what ? So this would mean .. If true .. I have zero doucet blood in me. ., of the French verity. . But Indian instead .. Funny my doucet grandmother .. Who father was I am told was mostly Chaktow as well .. There are two different Doucet Y haplogroup lines. From my phone, I can’t see the earlier comments on this thread, so I can’t comment further from here. Elaina work on your tree, see if they can help you at les trois pignones. Contact me at my email tell me the name of your parents and grandparents I will look in my tree and see if I can find them…tell me whatever you know…my tree is huge. My mother was a Doucette, and my first cousin Paul did the Y DNA test as we have Doucette/Doucet male line going back to France, but he goes through Pierre which is European Y DNA. My tree has a lot of Doucet/Doucette!! There is some evidence of continued contact with the New World by Vikings long after Leif Erikson (the Bishop appointed to Greenland in 1100s was also named Bishop of Vinland- for example). I just read one book online (The Secret City, Joan Hope) that argues the Viking Greenland colony fled to what is now Nova Scotia in the 14th century, fleeing increased warfare, famine in Greenland and the Plagues which swept Europe in the 1340s-50s. That is just over 600 years ago. I wonder if you might have accidentally stumbled on a genetic link to the lost Greenland colony? It would be interesting if there was an Old Norse link to the mystery C3B. Nope- C3B is unique to New World Native Americans- sorry- I should have looked it up prior to posting. If you have a straight line of Doucets going back, all male, get a Y DNA test for males only. There are other names beside Doucet in the study so look at studies done at family tree dna. The Y DNA is passed down from father to son over hundreds of years. There is also a test for women, mitochondrial, that is passed down from mother to daughter but that one does not follow a surname. es back home to show the family! Whether Germaine’s wife was Native or not has absolutely nothing to do with his haplogroup. He passes his Y chromosome to his male children and the Y chromosome is not mixed with any of his wife’s DNA.